[Note: The following, slightly adapted version, originally appeared on Bergen's blog. This morning, outside a playground full of brightly colored swings and slides in a camp for internally-displaced people in Arbat, Iraqi Kurdistan, I saw a tree. Actually, four trees. Four tiny trees, not much taller than me, planted by local NGO workers who were concerned about the children not having any shade in the summer heat, which can top 44C. I don’t know much about plants in Kurdistan, but I can guess that trees growing in rocky, parched clay in a high semi-desert do no grow very fast—it will be years before the trees can provide good shade. 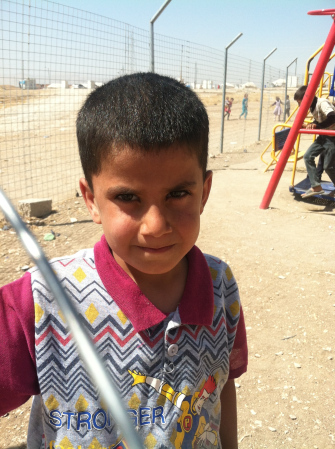 These children—Yazidi and Arab Muslim—have only been playing here for a month. Their families live in different parts of the camp, sectioned off by ethnicity and religion. The camp itself used to house Syrian refugees until a new camp was built for them. Iraq is near the top of the list for most IDPs and refugees, with over a million people fleeing violence in Syria, Iran, Turkey, Palestine and over two million more fleeing ISIS or remaining displaced after the U.S. occupation—all fruits of the tree planted by the U.S. War on Terror. that violence is the simplest form of communication—it does not require understanding about the other person’s worldview or opinions. The War on Terror has never cared about the real complexity of the lives it has destroyed (be they Taliban fighter, Iraqi civilian, or U.S. soldier). Instead, we have sought to rain terror on those who we blame for our insecurity and trauma. Our willingness to destroy a nation, with little more justification than to prove our masculinity and use a crisis to open up Iraqi oil fields, has planted seeds that will far outlive the careers of U.S. politicians and oil profiteers. For Iraqi people devastated by years of dictatorship and sanctions, for Kurds oppressed and manipulated for decades, and for Yazidis and others who have lived through centuries of oppression, the U.S. occupation manufactured and escalated sectarian violence that continued to burn long after U.S. troops left the country. trauma to end any time soon. It says that the U.S. bombs of today may defeat ISIS (and most Kurds I talk with are very happy about U.S. involvement), but they will not heal the wounds caused by the U.S. bombs from yesterday. There is also something hopeful about planting a shade tree outside a playground in an IDP camp. It says that we will not abandon our children to suffering without relief. It says that Kurdish communities know war and violence, and they will not be defeated. In the United States, we sometimes plant trees in memory of those who have died; in the semi-desert outside of Suleimani, trees are planted for the strength of the living. The meaning of September 11, 2001 changed for me when I met people who grew up in Manhattan and remembered the shadows of the planes, the ground shaking, the dust, and the funerals. Today, my understanding changed once again, meeting people still living in the nightmare created by the U.S. reenacting the trauma of 9/11 around the world. Today, here in the Tigris-Euphrates watershed, I saw a commitment to long, slow, and incomplete process of healing. Four tiny trees. Children on swings. I cannot help but think of the words of Archbishop Oscar Romero, said shortly before he was killed for supporting the El Salvadoran resistance to U.S.-funded violence. This is what we are about: We plant the seeds that will one day grow. We water seeds already planted, knowing that they hold future promise. We lay foundations that will need further development. We provide yeast that produces effects far beyond our capabilities. We cannot do everything, and there is a sense of liberation in realizing that. This enables us to do something, and to do it well. It may be incomplete but it is a beginning, a step along the way, and an opportunity for the Lord’s grace to enter and do the rest. I pray that we who live in the heart of Empire may have the strength to begin healing our nation and support the healing of all others. May we plant and water shade trees, holding the horror and beauty of this world as we work for a new one.